Some common myths often deter people from making compost at home. But by following the How to Make Compost tutorial, the myths evaporate. 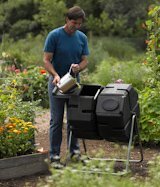 It's easy to make odor-free, pest-free, garden-healthy compost anywhere. Even if the only vegetable gardening you do is growing a few pots of tomatoes on your patio, making compost is worthwhile. Compost is a gift for the garden and the earth as well. When you know how to make compost with the right mix of ingredients, there is no smell. If you mix about 2-3 parts dry, brown plant material like dried leaves or weeds, with one part fresh green plant material like grass clippings or kitchen scraps, and keep it about as moist as a wrung-out sponge, it will decompose quickly with absolutely no smell. Myth 2) Composting attracts flies and rodents. There are now many excellent compost bins available that keep out rodents, and a compost pile made with the correct balance of ingredients will not attract flies. Myth 3) Composting is a lot of work. When you know how to make compost with the right balance of ingredients, it will break down all by itself. Depending on what kind of bin you use, composting can happen with no more effort than giving a quick, one-handed spin on the tumbler when you walk by. Myth 4) A compost pile is hard to manage. If you follow the basic recipe every time you add things to the compost pile, there is nothing to "manage". Every time you add kitchen scraps to the bin, add about 3 times as much dried leaves. Just water it once in awhile if it's getting dry. Myth 5) Composting takes too much time. With the different styles of compost bins available now, you have a choice of how much time it takes. The small, dual-batch compost tumblers take no time at all. You just add scraps and leaves, give it a quick spin, and leave it until the next time you have kitchen scraps to add. Even a large backyard composting operation in traditional open-topped bins, only takes about half an hour, twice (about 3 weeks apart), to turn, mix and aerate the compost. Myth 6) You need somewhere away from the house for a compost bin. This myth is associated with two others: that compost stinks and that it will attract flies, neither of which are true. 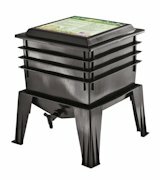 There are sealed compost tumblers that will keep even the most determined critters out, and when you have the right mix of ingredients, flies are not attracted. You can also do worm composting, right inside your house! Myth 7) Compost bins are pretty much all alike - a bin is a bin is a bin. There are many styles and sizes of compost bins, and they do not all work alike. Some are designed for adding waste continually at the top, and dispensing finished compost months later in small amounts out a little door at the bottom. Some compost bins are hinged to completely open at the front so you can turn the contents with a fork, and you use these to make a single batch of compost, which “ripens” all at once. Some compost bins are on an axle and tumble, so that you can mix the ingredients up every time you add scraps and leaves. The technique you use depends on the bin you choose. Myth 8) You can add earthworms to a compost pile to speed it up. Worm composting works wonderfully, but it’s a completely different process than traditional composting. A traditional compost pile is not a good place for worms, because the decomposition process makes it get too hot. A worm bin works on a different principle and you can read about it in the worm composting article. Myth 9) Adding a handful of soil makes composting faster. The organisms that break down compost are present on the scraps and leaves you are adding. Adding soil will not speed up decomposition. However, adding soil to you compost is important for another reason: the little bit of clay in most soils has a magnetic quality when it comes to certain nutrients. Add a bit of soil, and these nutrients bind to the clay particles and are prevented from washing away when it rains, while remaining available to the plants when they need them. Myth 10) If I use fertilizer on my garden, I don't need compost. There are many benefits of compost, and they are different than fertilizer. Compost helps create important soil structure, optimizes water retention, keeps nutrients from washing away, moderates pH and most importantly, provides necessary microbes that make nutrients available to plants. Myth 11) If I use compost on my garden, I don't need fertilizer. Compost provides microbes and some nutrition, plus all the benefits listed above, but unless your soil is already filled with the right balance of complete minerals (see the soil test and organic fertilizer pages), you will still need to amend your soil with organic mineral nutrients until it is balanced.